Congratulations to Denise Beckand, giveaway winner! 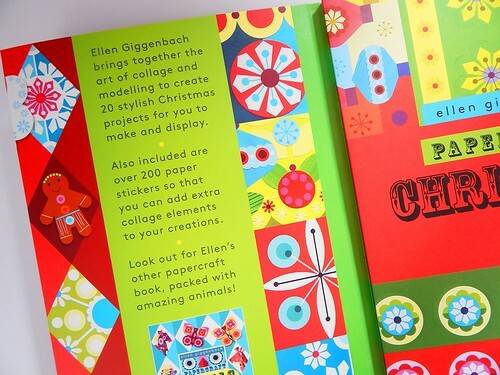 For those of you with little ones at home or simply a love of mid-century folk art with its vibrant colors, Ellen Giggenbach's new book Papercraft Christmas from UK publisher Templar is sure to be appealing. Ellen, who was born in Bavaria and lives in New Zealand, creates her designs initially by hand cutting, then she assembles the graphic shapes and paints them with bright acrylics. 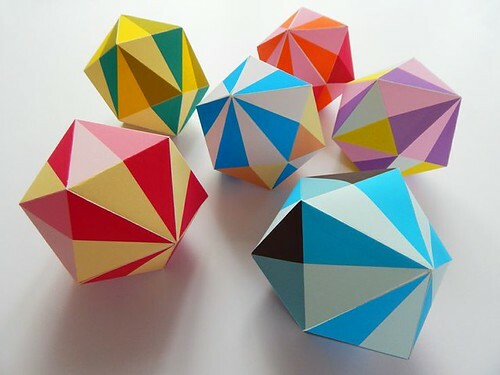 You might recall a previous post about her paper home decor that included these Modern Geo Balls. They are available via Etsy as an instant download; she also offers paper craft kits. 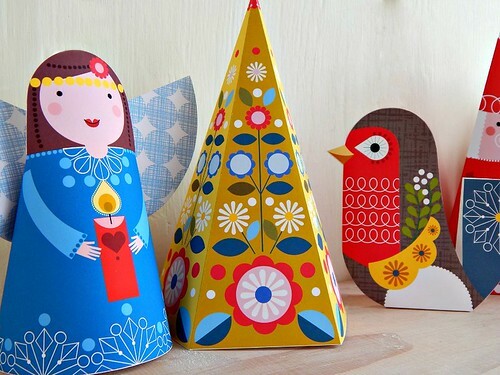 Additional Christmas printables in the shop include these cute dimensional figures. But let's get back to the book! 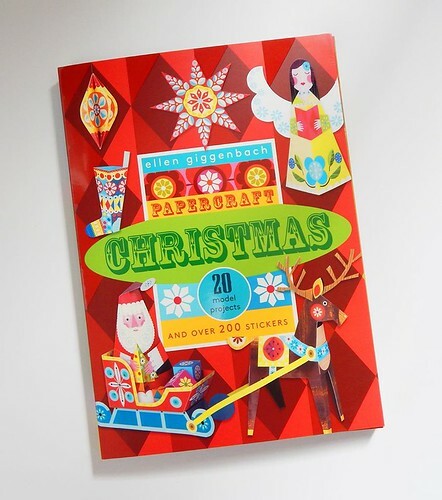 Within Papercraft Christmas's removable pages, you'll find tree ornaments, Santa and his reindeer-drawn sleigh, a snowman, tree, angels, plus more, to cut, fold, and assemble. After all of the models have been made, let them be a springboard to making more with plain paper. Decorate with the included 200 adhesive-backed stickers. 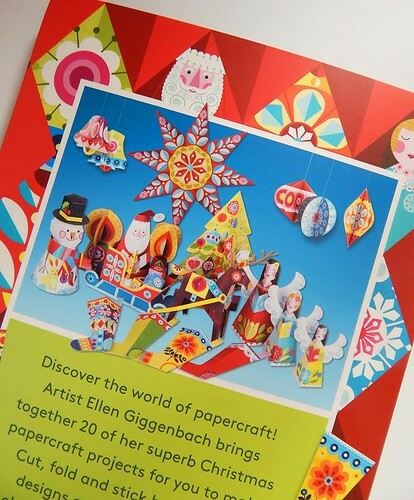 Ellen will be sending an autographed copy of Papercraft Christmas to one lucky person anywhere in the world. Leave a comment as your entry through Sunday, November 23, 2014 and be sure to include your email address within your comment as Blogger doesn't allow me to see the top portion of the form. The winner will be selected by a random number generator and announced on this post when she or he has been notified. Good luck! Wow, that book looks fun! This is a very interesting book! I'd like to get one! What a stunning, beautiful book! Would so love to win a copy! Such vibrant colors! I like that large star!! What beautiful paper creations - love everything! This is very cool. What a great book! Such beautiful, colorful and happy projects! I love Ellen's wonderful designs and would love to decorate for Christmas with these fun decorations. Thank you for such a great giveaway. Wow, the creations are so pretty - I love the 'new' colours of Christmas! How fun, one can never have too many paper crafting books! Thanks for the giveaway chance. Awesome book! Love the bright colours & simple shapes, my kind of design!! I love the look of that book! Looks like a really cool book. Would love a copy. I would love to win that.! The paper models are all so bright and colorful ! Would love to win a copy. Thanks for the chance. 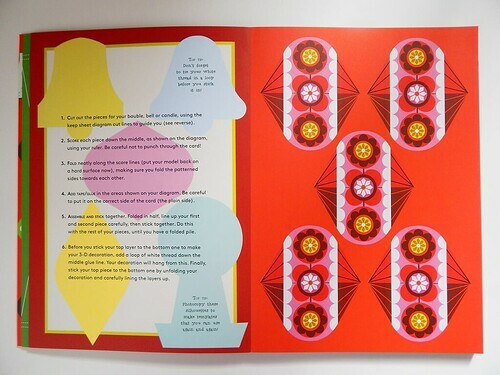 I really like the folk art style, love to win this book of Ellen!! I love the book... all the bright colors are wonderful! Thank you for the giveaway! 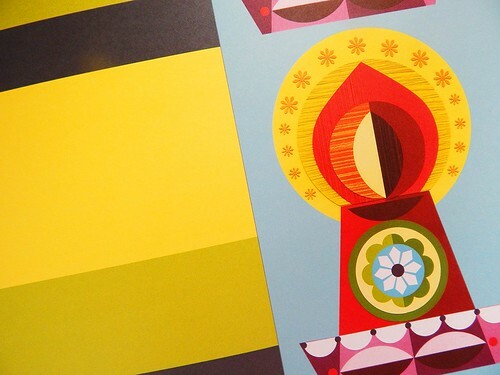 I love Ellen's work and would enjoy these bright colors for the holidays. Oh how cute, and could be adapted to other seasons....thanks for the chance to win it!!!! I Love the beautiful patterns and color combinations. A book filled with loads of fun! Let's see if the fourth time trying to post is a charm!! This looks like such a nice book with its very vivid colors. I would love to have a copy. Thanks for the chance to win. This looks scrummylitious and happy. All those lovely this would bring my shelves alive. Really nice book. Thank you for the chance! Love Ellen's colorful folk designs, such a good win. I love Ellen, I love her works... The colors and design are amazing! I love Xmas and illustration. This book HAS to be mine!! Looks like great fun - LOVE the bright colors! What a super cute neat family activity! I'd love to do this with my kids! dominique@mywahw.com thanks! The giveaway has ended. Thanks for your entries and enthusiasm about the book! Oh how fun! Thanks for the opportunity!